Optimal Industrial Automation, one of the UK’s leading integrators of 'difficult to deliver’ automation systems for the food, pharma and chemical industries, has developed a range of control automation solutions for pilot and commercial-scale freeze dryers. Optimal’s solutions champion the use of closed loop control, SCADA layers and the latest data historians to improve system efficiency, plant integration and the quality and consistency of the finished product. Martin Gadsby Optimal MD comments, 'We are well known for building and integrating automation systems for Life Science and other process industry manufacturing equipment, typically when the application or surrounding conditions make it too complex to deliver for the majority of mainstream system integrators. 'Working with freeze dryers is no different, however, since Optimal has completed a large number of new and retrofit projects in this area we have used our experience and knowledge to develop and formalise a range of control systems specifically for industrial freeze dryers. 'Freeze drying in this context is the process by which water (and other solvents) are removed from a frozen material by sublimation and secondary processing - the sequence is generally as follows: freezing, primary drying (sublimation), and then secondary drying (desorption). The high financial value of pharmaceutical products and strict manufacturing and traceability guidelines set largely by the US Food and Drug Administration (FDA) also make it essential that correct procedures are followed and records maintained. There are some major challenges therefore during the process that makes close control particularly important. 'The three principal stages to freeze drying start with the freezing phase, which is a critical step in the freeze drying process as it has a knock-on effect on the rest of the process. Following best practice methods at this stage can reduce drying times by up-to 30%. Freezing can be done in a freezer, a chilled bath (shell freezer) or on a shelf in the freeze dryer. Cooling the material below its triple point ensures that sublimation rather than melting will occur. This in-turn preserves its physical form. 'Large ice crystals are easiest to freeze dry. Slow freezing or annealing will produce larger ice crystals. However, for Biological materials, if the crystals are too large, they may break the cell walls which will offer less than favourable freeze drying results, so, to prevent this from happening, the freezing is done rapidly. For materials that tend to precipitate, an Annealing process can be used which involves fast freezing, then carefully raising the product temperature to allow the crystals to grow. 'Primary drying (sublimation) is the phase in which the pressure is lowered and heat is added to the material in order for the water to sublimate. The vacuum speeds sublimation. A cold condenser provides a surface for the water vapour to adhere to and solidify. The condenser also protects the vacuum pump from the water vapour. About 95% of the water in the material is removed in this phase. Primary drying can be a slow process and too much heat can alter the structure of the material, so fine control is essential. 'During Secondary drying (adsorption), the ionically-bound water molecules are removed. By raising the temperature higher than in the primary drying phase, the bonds are broken between the material and the water molecules. Freeze dried materials retain a porous structure, so after the freeze-drying process is complete, the vacuum can be broken using an inert gas before the material is sealed. Most materials can be dried to 1-5% residual moisture. 'Given the potential for error, it is essential to have a control system that can both maintain the required conditions for freezing and heating and also respond quickly to address any potential variations in process conditions. Any control system used for a freeze drying application should ideally be capable of automatically adjusting the process to maintain the ideal conditions. The control system must therefore provide a fast, easy to use HMI and inherent control flexibility, in addition to providing accurate and reliable control of each freeze drying cycle. Traditionally, open loop control systems have been used, with the freezing and heating temperatures and the chamber pressure being controlled according to a specific profile. However, this approach has several drawbacks, including the inability to cope with temperature variations outside of the set profile. With no way of accelerating the process if conditions change, the overall freeze drying period is also prolonged. For optimum control of the freeze drying process, a closed loop control system should be used. Data from the pressure and temperature sensors is fed back to the controller where it is compared to a reference value. The controller takes the difference between the output and the reference value and uses it to change the inputs to the system to help compensate for the difference. The result is a more dynamic and precise control of the freeze drying process, with the ability to address any unexpected fluctuations in process conditions. The main innovations in the recent development of freeze dryers have been in process control and the automation of the loading and unloading processes. Optimal has used its in-depth knowledge and experience to develop a range of integrated control systems for freeze dryers. Ranging from Client Server SCADA systems to much more basic designs, a system can be developed to suit the exact requirements of the client. Optimal has also achieved significant improvements in productivity by the use of data historians to capture critical and quality parameters. Data historians allow users to archive and retrieve years of useable data in a fraction of the time of a conventional relational database. Data is formatted and presented in way that is easy to process and interpret. When combined with Overall Equipment Effectiveness (OEE) systems, the performance and productivity of each dryer is maximised. Due to the inherently complex nature of freeze dryers, the standard offering provides a high level of automation for a single system. The use of a single SCADA interface on the system offers fully automatic as well as manual control. The design has a recipe system together with historic and real time trending plus data logging to allow batch reports to be produced. One recent system in particular is fully automatic in operation and uses a Rockwell based solution with a Control Logix PLC together with RS View and Rockwell’s Plant Metrics for process optimisation. All salient parameters are stored to the historian and trended on the screen as necessary. The software then produces batch reports at the end of the production cycle. The system sits on a corporate LAN to enable authorised users access to the data for process optimisation. Looking to the future, demand for aseptic packaging and preservation, as well as the rise in production of protein-based drugs is expected to continue to boost global demand for freeze drying capacity. 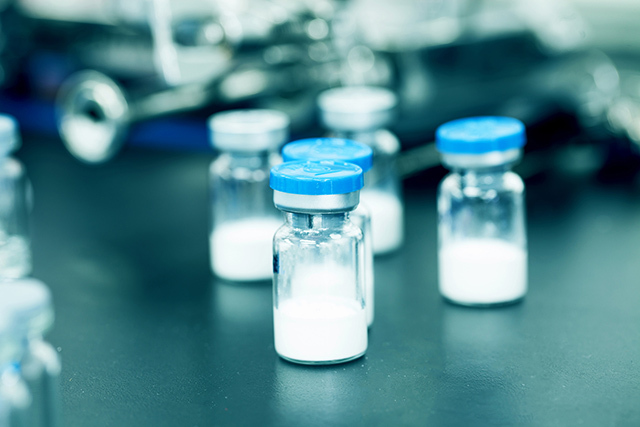 This means pharmaceutical manufacturers and their equipment suppliers are turning to an array of advanced process analytical technologies (PAT) to help optimize their freeze-drying operations.